Luna is a lovely full accoyo girl with a great personality! She just won a blue ribbon as a white 2-year-old at the 2017 RailSplitter Alpaca show. Luna has decided that people and carrots are wonderful parts of her life. She demonstrates perfect phenotype, correct boxy stance and long,fine fleece. In early 2017 we stood in the pasture and came to the stunning realization that Luna may be our best animal. We immediately loaded Openherd and increased her price. She’s a keeper! Born under a the full harvest moon, Luna was our first cria. She arrived within a month of starting our alpaca adventure. 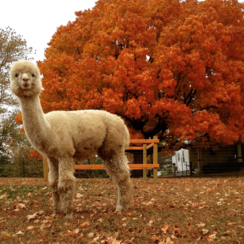 Talk about a crash course entry into the world of alpacas! What an amazing little lady. Luna is a fine-fleeced White with a hint of blue in the eye, perfect hearing and a sassy, sassy personality! After careful research, we feel she will be a spectacular foundation female. Her mother’s histograms are 18 microns as a two year old and her sire, Heather’s Acres Accoyo Sergio is a white multiple banner winner. Luna’s first histogram reveals a fine fleece of 16 micron average fiber diameter. In our herd, Luna will be bred to elite males for her high probability of producing industry-leading offspring. Her dam, Ishsha has distinct lineage and loads of awards in her pedigree as well as offspring that keep bringing home the blue ribbons. We think Luna is the gem of the bunch. She is one of those animals that gets better every year and is quickly earning a spot as our leading foundation female. Note: Luna suffered frostbite to the tips of her ears when mama was out for breeding. As a result, Luna has lost the tip of one ear. While her ear is not a functional problem, she does stand out in a herd! We are expecting great things from these incredibly powerful genetics.